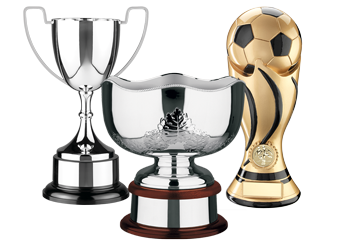 Classic trophy cups and awards, and a huge range of sports trophies. 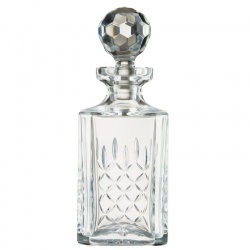 Classic crystal awards and gifts, and a huge range of modern glass awards. Gold, silver and bronze medals, plus schools and sports specific medals. 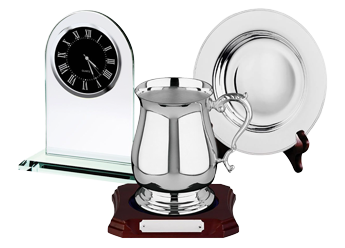 Presentation clocks, tankards, whistles, trowels, trays & salvers. Classic wooden awards shields, and modern glass awards plaques. 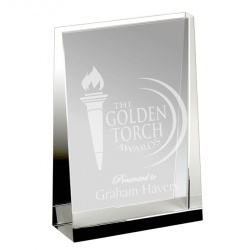 Custom awards in perspex and/or metal, designed for your needs. 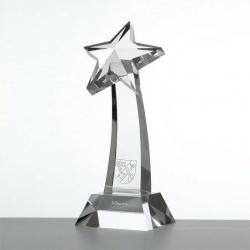 7.75in Crystal Award with Star on Curved Column with Bevelled Base. Clear crystal award in wedge shape. Presentation boxed. 5 sizes. Silver Outside, Gold Inside, on Wood Base with Plinthband. 9in tall. 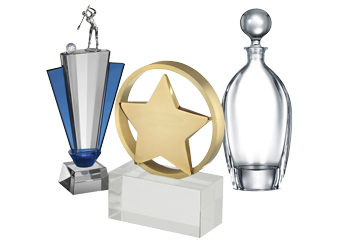 Awards Trophies Supplier is a UK-based supplier of fine quality trophies and awards, including sterling silver and silverplated trophies and trophy cups, handcut crystal awards, and traditional awards plaques and shields. Our range of sports trophies includes a large selection of golf trophies as well as sports-specific awards including football trophies and equestrian trophies. 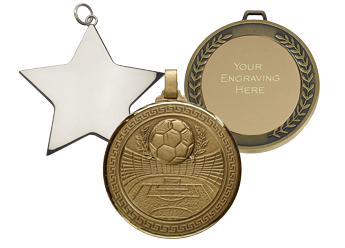 We offer low, fixed-cost text engraving and free logo engraving, along with fixed price UK delivery, on all orders. Our golf trophies sections offer a large selection of golf trophies, crystal golf awards and golf plaques suitable for all levels of achievement, from local golf clubs and youth tournaments up to professional golf awards. 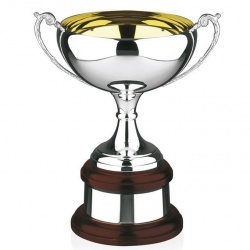 Included in our prestige trophies collection are a number of magnificent hand chased silver cups. Our silver golf trophies section showcases a range of fine quality silver golfing trophy cups including some of the finest quality sterling silver and handchased silverplated golf trophies and awards available anywhere. Our selection of crystal golf awards includes handcut lead crystal golf awards and clubhouse trophies. 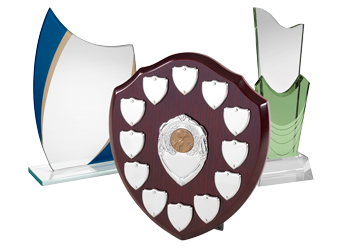 We also supply golf plaques and shields in our range of golf presentation awards. 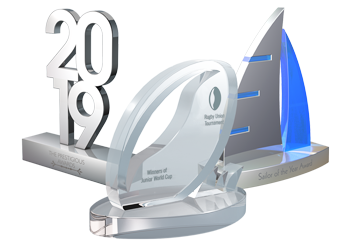 All these plaques, trophies, contemporary crystal awards and presentation trays and salvers come with our offer of low-cost engraving and fixed cost U.K. delivery. We can't say fairer than that!